Let’s talk Turkey. I am someone who has been a fan/follower of Chef Bobby Flay ever since his 1990’s show Grillin’ and Chillin’ with Jack McDavid. I have long admired Bobby Flay’s impressive culinary skills- on and off the Grill. Most recently, I enjoyed viewing the “Give Thanks for Barbecue” episode of Bobby Flay’s BBQ Addiction where he made Cajun Turkey Two Ways. Filmed in 2011, the Food Network is showing it again for this year’s Holidays. While most of the episode is incredibly informative, allow me to add a few things to help make your Holiday Turkey even better. Long before winning the title of Grill Master on the Food Network’s Cutthroat Kitchen, I have blogged Easy Grilling and BBQ Recipes for years. With all due respect, I’d like to add a different perspective, to help some of you avoid “Holiday Dinner Disasters”. Bobby Flay’s BBQ Addiction is seen by millions of viewers, so surely much of the material is scripted. Hopefully, Bobby Flay will agree that a few things could be explained a little more. 1. A Word on Spices. Bobby’s Cajon Rub combination is excellent. However, spicy food isn’t necessarily a part of traditional Creole/Cajun Cooking. Hot Cayenne Pepper and Spicy Chilis were introduced to New Orleans cooking in the 1980’s by (the late great) Chef Paul Prudhomme. Which is fine. For home cooks that are sensitive to spicy food (like me), the Rub without hot spices will still be delicious, and boast Cajun flavor. 2. Make Brine with Less Salt. Bobby’s original Recipe calls for 1 + 1/2 Cups of Kosher Salt for a 24 Hour brining period. For families on a Diabetic or Low Salt Diet, your Turkeys can be brined with a lot less Salt by using a combination of Low/No Salt Chicken Broth, Orange Juice, Apple Cider and/or Water to brine your Turkey for the first 24 Hours. It will still come out tender and juicy. 3. Dry Season for the Next 24 Hours. On the “Give Thanks for Barbecue” episode Bobby suggests a second 24 Hour drying period with the Naked Turkeys out from the Brine. Then he re-seasons the Turkeys with BBQ Rub on the outside only, right before putting them on the Grills. I suggest that instead, you add the additional BBQ Rub coating a day in advance. The flavors will really penetrate the meat during this second 24 Hour period. Also, be sure to season the Turkey top and bottom, as well as inside the cavity. Some people also stuff it with fresh Parsley, Thyme and/or Skin-on sliced Oranges or Lemons to flavor it from the inside-out. Others also add Dry Seasoning and Herbs underneath the skin to marinate for the 24 Hours. 5. Finally, Allow for Extra Cooking Time. On the episode, Bobby cooks two 13 lb. Turkeys in only 2 Hours and 15 Minutes. You at home may be cooking Turkeys up to 20 to 25 lbs, which will take considerably more time. The key is to use an embedded Grill Safe or Instant Read Thermometer. Also be ready to replenish the hot Coals as many times as needed. 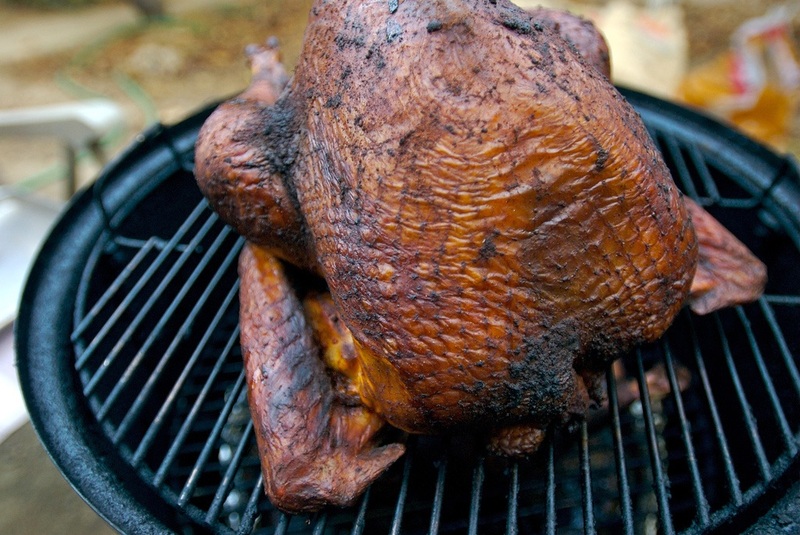 Before taking the Turkey off the Grill to rest, be sure the Breast temperature is at least 165-175 degrees. Thanks again Bobby Flay for teaching us so much about Cooking over the years. Though I have not seen an official poll, I would bet that he has appeared on more food shows than any Chef since Julia Childs. Keep up the great work Bobby! To everyone Grilling/Smoking Turkey this year, I wish you the happiest and most delicious Holidays ever. Also have an awesome New Year!